Discussion in 'Transformers Toy Discussion' started by megatronski, Jul 27, 2010. How tall is he compared to ROTF leader prime? He is MUCH bigger then leader Prime, definately by a few inches, and he is much more bulky. As to which version, Classics would probably be cheapest. You could also try getting a second hand version, if you can beat the customizers to it that is. But if you want G1 accuracy and don't mind paying a bit extra, then it might be worth waiting for the upcoming Takara remold. yep, he's a healthy boy next to the RotF Leader figs. Mine is currently holding in it's hand a spare WST Optimus Prime. 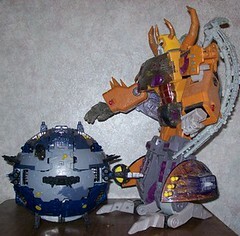 I really want the Takara version, but won't get it because of the price and lack of needing a second Unicron. also, just so you know- he is most definitely bigger than Primus- it ain't even funny looking at them together.